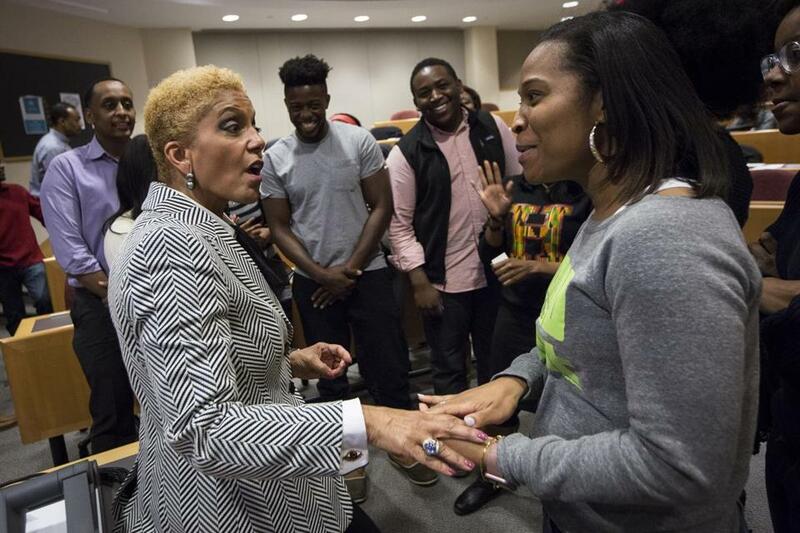 Linda Johnson Rice (left) of Ebony visited Harvard this month. They are arguably the most influential reference works in the field of business management: Harvard Business School’s case studies. From factory working conditions to the cola wars and the sharing economy, the graduate school has over decades published thousands of deep-dive studies into how businesses tackle their toughest challenges — research that’s aimed at teaching MBA candidates what works and how decisions are made. Yet as central as these case studies are at Harvard and business schools around the country, they’ve been missing a key element, according to Steve Rogers, a senior lecturer on entrepreneurial finance at Harvard Business School: the stories of African-American executives. Rogers, who has taught at Harvard for five years, estimates that less than 1 percent of the school’s approximately 10,000 studies features a black executive — even as 9 percent of US firms are now black-owned. His goal is to change that, one study at a time. For the past year, Rogers has been trying to ensure that along with cases that explore subjects such as Steve Jobs’s struggles at Apple and Howard Schultz’ challenges in growing Starbucks, there also are examples of black executives facing similar critical crossroads in their businesses. Rogers has written 14 new case studies with black executives in the central decision-making role, or, in HBS-speak, as the protagonist. He is using many of these case studies this semester in his own class, “Black Business Leaders and Entrepreneurship,” the first to have such a focus at Harvard. And Rogers is encouraging other professors at the nation’s leading business school to include more diverse voices in their own curriculum. The need to expand the racial diversity of case studies is more important than ever, Rogers said. The economy is growing, but not for everyone. For instance, the national unemployment rate dropped to 4.8 percent in January, but for black workers it remains significantly higher at 7.7 percent. Black-owned businesses are the primary employer of black workers, after the federal government, Rogers said, so encouraging more black entrepreneurs is key. In 2012, there were 2.6 million African-American-owned firms in the United States, up from 1.9 million in 2007, a more than 35 percent increase, according to the US Census. Steve Rogers, who has taught at Harvard for five years, has written 14 new case studies with black executives in the central decision-making role. The subjects of Rogers’s cases span the business world, from real estate and finance to publishing and cybersecurity. Some of his subjects are well-known, though not celebrities. Many are simply entrepreneurs facing the same challenges that most of Harvard’s graduates will encounter in business. The majority are culled from Rogers’s own Rolodex of executives he has met throughout his career. His subjects include Linda Johnson Rice and an examination of her decision in 2016 to sell Ebony magazine, a publication her father launched during a time when segregation was the norm in America. Carmichael Roberts, a partner at the Waltham private equity firm North Bridge Venture Partners, is featured in a study that explores whether and when to strike out and create your own fund. And Valerie Daniels-Carter, whose company owns more than 130 restaurants nationwide, plays a key role in a case study about the franchise industry. Their race is mentioned in the stories, but racism itself, as a problem to overcome, isn’t usually the central theme. So, for example, Roberts’s childhood — he grew up in a public housing project — and his position as one of the few African-American general partners in a venture capital firm, are mentioned in the case study, but the management challenge that’s the report’s focus is how he decided when to launch his own fund. When Rogers approached him to participate in a case study, Corey Thomas, chief executive of Rapid7, a Boston-based cybersecurity firm, knew firsthand how expanding the diversity of voices in business school studies could help students. The lack of black protagonists in case studies frustrated Thomas when he was a student at Harvard Business School 15 years ago. He had to seek out information about black entrepreneurs on his own, looking for role models in business. He dug into the stories of Madam C.J. Walker, who in the early 1900s created a line of beauty and hair products for black women, and even his wife’s grandfather, who held leadership roles in industrial plants. 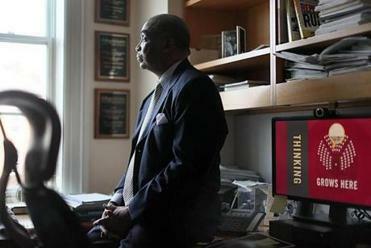 Harvard Business School officials say they are trying to diversify case studies, which have been a key part of the curriculum almost since the school’s founding in 1908. The school also does a hefty business providing studies to other business programs — in 2015 alone, it sold 13.2 million copies of cases. Most of the case studies are developed and written by the school’s professors and rely on their business contacts and are driven by management cases that intrigue them. In 2014, Harvard Business School Dean Nitin Nohria pledged to double the number of women protagonists in case studies by 2019 to about 20 percent from 10 percent, after the school was criticized for the lack of women as decision-makers in its cases. The school also is aiming to increase the racial diversity of its study subjects, said Jim Aisner, a spokesman for Harvard Business School. “We are paying much more attention to this and committed to increasing the numbers of blacks and other minorities represented in the cases,” Aisner said. For Rogers, though, the mission is personal. “I want to make sure we’re included in the stories,” he said.